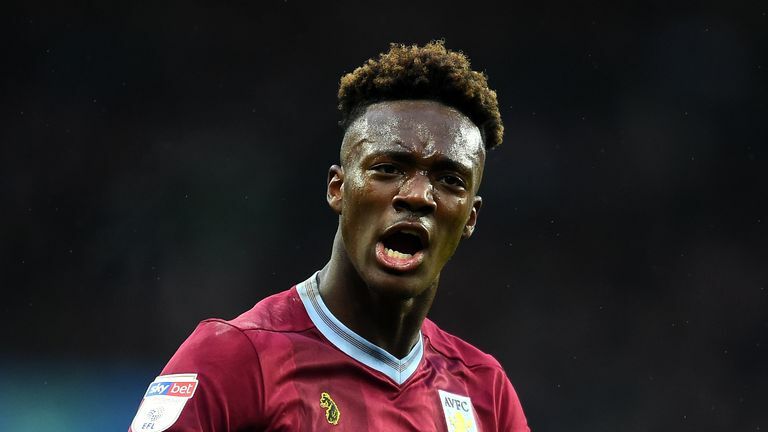 Wolves are close to agreeing a deal to sign Tammy Abraham on loan from Chelsea, Sky Sports News understands. Wolves were initially keen on a permanent deal but Chelsea are unwilling to sell the striker, who is currently on loan at Sky Bet Championship side Aston Villa. But a temporary move could now be agreed, with Wolves keen to boost their attacking options. Abraham has been in prolific goalscoring form for Villa this season, scoring 16 goals in 20 league matches. That included four goals in their 5-5 draw at home to Nottingham Forest in November. The 21-year-old has previously impressed on loan at Bristol City and Swansea but has never secured a regular run in the Chelsea first team. Abraham did play twice for Chelsea at the end of the 2015/16 season, coming on as a substitute in the 1-1 draws against Liverpool and Leicester. He also came off the bench to replace Alvaro Morata in this season's Community Shield defeat to Manchester City. Given that Abraham has been at two clubs this season, there was some concern on social media that a transfer to Wolves might be in violation of the 'FIFA Two' rule, which states a player can be registered with three clubs in one season but only play for two. However, as all three clubs are English, this falls under the jurisdiction of the FA rather than FIFA, although the FA has not ruled out seeking final approval from FIFA. The FA does not view Abraham's appearance in the Community Shield game as an 'Official Match', instead deeming it an 'Invitational' game, and is happy for him to be registered and play for another club this season.